Pizza made fresh daily, Sicilian Delight offers a wide selection of pizza and pastas. 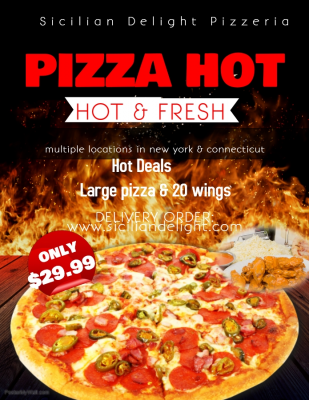 Large pizza and 20 wings only $29.99 at Sicilian Delight! 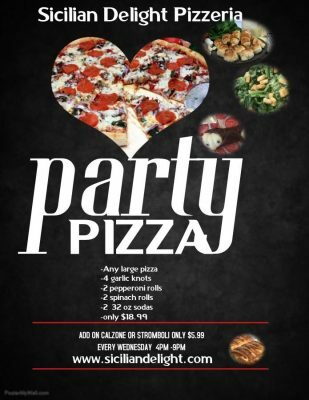 Every Wednesday 4pm – 9pm take advantage of the Sicilian Delight Pizza Party Special! 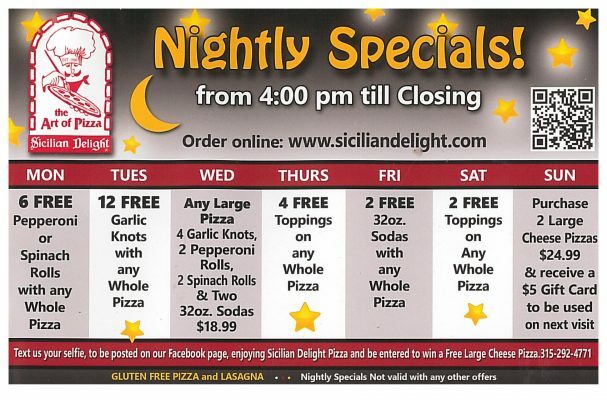 Stop into Sicilian Delight for their 2 large cheese pizzas deal for $22! *$14.99 Large Cheese Pizza and 4 medium drinks. *Monday- 6 free Pepperoni or Spinach Rolls with any whole pizza. *Tuesday- 12 free Garlic Knots with any whole pizza. 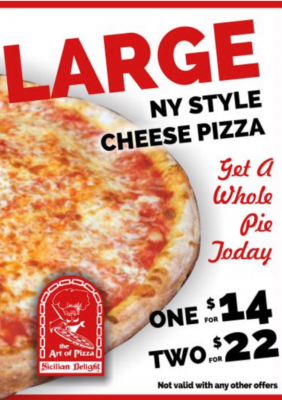 *Wednesday- Any size cheese pizza, 4 garlic knots, 2 pepperoni rolls, 2 spinach rolls and 2- 32oz sodas $13. *Thursday- 4 free toppings- Sicilian or any whole or half pizza. *Friday- 2 free 32 oz sodas with any whole pizza. *Saturday-2 free toppings on any whole pizza.